How to Stop Hating Your Business: 8 Things to Do Now! Has your business become the bane of your existence? Something you dread? Something that weighs you down and seems like a hopeless cause? Do you find yourself hating your business – even though you can’t bare to admit it? Don’t worry, although rarely discussed, it’s a common scenario. Owning and running a business is hard – really hard. Not just in the sense that there’s a lot of hard work involved. But also in the sense that you don’t know how or if it will work out, you’re not sure whether you’re making the right decisions, if you can meet payroll next week, if your product is actually going to work, or if customers are really getting value from the service you provide. And yet, at the same time, the onus is on you to motivate your staff, give a convincing pitch for your product/service, reassure the people depending on you that you’ve got things under control, and generally paint a positive picture to the outside world. ARRGGGH! So if you’re feeling like this at the moment, here are some ways to stop hating your business and get back some of your business mojo! Being clear about the vision for your business is usually one of the strongest motivators for entrepreneurs. But it might have been a while since you took the time to visit your vision statement, or maybe you haven’t yet articulated one. If this is the case, go back to why you started the business in the first place, what your hopes and dreams for it were (or are), and define a vision that can inspire you and the people you work with. Then, really let yourself be inspired. Don’t think about this as just words on a page (or a wall). Really internalise that future that you’re imagining and let yourself get excited again. Along a similar vein, get even more deliberate and inspired about the future of your business. Draft out an ideal organisational plan for your business 3 years from today. Imagine a perfect world and list out all the positions in your business and the responsibilities that they will fill – or draw it as an organisational chart. Imagine the role/s that you’ll be playing at this point in time – and more importantly, the things that you won’t need to be doing. Then, take it one step further and picture a perfect day at work. What sorts of things will you be doing? Imagine all the things you hate doing being taken care of by someone that you can trust that thrives on those tasks. Now you’re just overseeing or occasionally checking on their work and you’re free to do the types of things that actually give you energy. List out everything you can think of about that perfect day; What times do you start and finish work? Who’s on your team? Where are you working? What tasks are taken care of? What do you get to work on now? What positive feedback are you getting from customers/staff/media? Get as detailed as you can about what makes that day great. Ok, so now that you’ve got a bit of inspiration with the ideal future team, think about whether you can take one step in that direction right now. Can you start outsourcing your bookkeeping? Hire a customer service assistant? (Maybe part-time?) Recruit an office manager? Give extra responsibilities to someone on your existing team? Nothing makes more of a difference to your morale than having great people to work alongside. Wherever possible, hire people that are highly motivated and smarter than you (think you) need. Then start planning to recruit asap! I wrote about the huge benefits of being part of a mastermind group here but one of them is undoubtedly the kinship that comes from regularly meeting with other business owners / entrepreneurs in a similar situation to yourself. Even if it’s an informal arrangement with just one other person, set up a regular get together (meeting / dinner / workshop / coffee / drinks night), and use it as an opportunity to brainstorm on problems you’re tackling, share some wins, and share your plans for the future. Although it might start slowly, you’ll be amazed at the difference this resource can make to the way you feel about your business. I don’t know about you, but there is nothing much more rewarding than hearing positive feedback from happy customers. So why wait for someone to randomly think about writing to you or calling to give unsolicited praise? Orchestrate this feedback yourself! Not only is this great for your mood, you can make it really useful for your business too by creating powerful customer testimonials (see the exact steps to do this are here). Speaking to customers can also give you great insights – especially if you’re facing difficult decisions or are at a crossroads with your business. Sometimes a simple conversation with a customer can shed light on the situation and clarify your direction forward. As you’ve probably noticed, there is NO END to the work. Regardless of how much time you put in, or even how smartly you work, it will never be done. Depressing? Yes, but it can also be liberating because the only thing that really should determine how much you work is you. Have you ever heard Parkinson’s law that says “work expands to fill the time available for its completion”? (You can look it up here.) Well it’s definitely true for many entrepreneurs. So the trick is to put limits on your working hours. Sign up for something that you can’t miss at the end of the day. Schedule dinner with friends so that you don’t work at night. Or, refuse to log on during weekends. Make it a goal to set some concrete limits on how much you are physically working. Be realistic, but don’t worry too much because the more ruthless you are, the more effective you’ll become with your time. Often when we’re working hard, we neglect any exercise routines we had, we start eating rubbish, and our sleep is impaired (quality, quantity or both). This is a vicious cycle because we start feeling sluggish and tired and we stop thinking clearly – and then feel like we need to work even harder – just to keep up. If that’s you, it’s time to put a stop to that cycle and just prioritise your health. Figure out what the most important aspect of getting your health back on track and make it a non-negotiable. It could be getting to bed by a certain time, taking a morning or lunchtime walk, getting home in time to cook a healthy dinner, or whatever. Don’t try to do everything but be sure to do something. When you’re in the slog of business and you know you just need to hunker down and do the work to get your business to a certain level before you can make any changes, a personal reward can work wonders. When things were taking longer than I’d hoped at my last business, I set a stretch goal to reach a certain number of paying subscribers and as a reward, I treated myself with something I’d wanted for a long time – a Vespa. Having that reward in mind made making the calls just a little bit easier, and then later, riding the Vespa to work always reminded me of how far we’d come since that particular milestone. A reward doesn’t need to be huge and it might even be something you’d almost do anyway, but you could improve it a bit by making it a goal. A nice dinner out with your partner? A new watch / outfit / phone? A short break away? Something for your home? Something for your office? Think of something big enough to motivate you but not so big that it ruins you! These are some of the ways that I’ve used in the past to keep motivated. I’d love to hear what else works for you! How have you stopped hating your business? 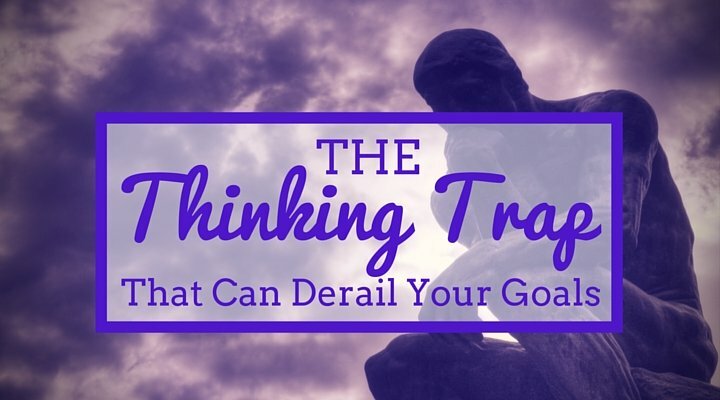 The Thinking Trap that Can Derail Your Goals How do you make important business decisions? The Dangers of Thinking too Small Why haven’t you started your business yet?